As a daughter of missionary parents and grandparents, Dr. Sarah Whitehead grew up with a deep awareness of the satisfaction that comes from serving others. She spent her childhood in a small village in the Republic of Botswana, located in Southern Africa. Inspired by her grandmother, a pediatrician who founded a hospital in the Bush of Zimbabwe while raising five boys, young Sarah came to understand the difference good medical care could make in so many lives. Returning to the U.S. as she began her college studies, she never wavered from her commitment to study medicine. Dr. Whitehead first realized her interest in women’s health as a Samford University student volunteering at a mission hospital in Bangalore, India. 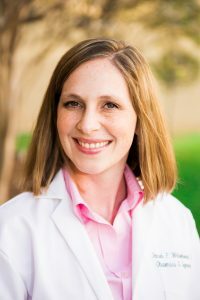 She says the first time in her training that she delivered a baby she knew “I would be happy doing this the rest of my life.” Dr. Whitehead distinguished herself as a medical student achieving nomination to the prestigious [Arnold P.] Gold Humanism Honor Society. The distinction recognizes medical students who excel in “clinical-care, leadership, professionalism, compassion, patient-care and dedication to service as selected by their peers.” Her practice interests also include women’s wellness through health education and preventive care. Through her husband Andrew, Director of Mid-Term Missions at the Church at Brook Hills, Dr. Whitehead remains close to individuals and families engaged in in this important work. She and Andrew are the devoted parents of toddler Josiah and baby sister Abigail.